There seems to be a lot of misconceptions about almost everything in life, this is however not surprising as no one is all knowing. Misconceptions are raised due to the different perspectives individuals have on issues. CrimsonBow Sickle Cell Initiative will be bringing to you a series that will discuss and educate you on the popular misconceptions that are related to the Sickle Cell condition. To read the first of the series, please click MISCONCEPTIONS RELATING TO SICKLE CELL – I : YELLOW EYES. The second of the series will be discussing the misconceptions of SCD individuals with huge tummies (stomachs). I remember while growing up, I permanently had a big belly. This was a great bother to me then as I felt constantly embarrassed by it. I had to deal with various questions, comments and looks. I heard questions like ‘do you have kwashiorkor? ‘ ‘have you over-eaten again?’ as well as ridiculous ones like ‘are you pregnant?’ Kwashiorkor is a life-threatening and debilitating form of malnutrition, I definitely was not malnourished. I liked food quite all right, but I couldn’t have been said to have over eaten all my adolescent and teenage years, and I know for sure that I was not pregnant. 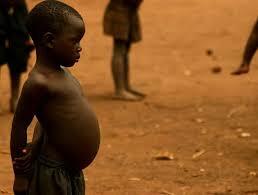 Picture of a chilled with Kwashiorkor, culled from the internet. Let it be mentioned here that not every individual living with SCD is known to have protruding bellies, but to those who have it, it may be as a result of their enlarged spleen, liver or both. This is because the spleen or/and liver are overworked in the job of breaking down sickle cells and the conjugation of bilirubin. This results in the cells of the liver and/spleen enlarging to compensate for their increased functions (The medical term for this is hypertrophy). I lost the big belly in my mid twenties, after my visit to Doctors who specialize in blood diseases especially sickle cell (Hematologists). They treated and taught me about how to take care of myself. The big belly occasionally resurfaces once I have overworked myself. It usually is a warning for me to slow down. Even though some drugs and lifestyle changes did it for me, Doctors will advice splenectomy (removal of the spleen) when it becomes worrisome. Immunization against some organisms may have to precede the surgical procedure. Most people living with Sickle Cell undergo auto-splenectomy before attaining adulthood, this is when most people don’t need to remove their spleen, as the spleen dies and gets removed in a natural process due to it being overworked or suffering repeatedly from inadequate blood supply. This is very common in SCD individuals. There is however no treatment for an enlarged liver. Partial hepatectomy (removal of parts of the liver) is not advised. Having mentioned all these scary complications, a big belly in an SCD individual might just be as a result of constipation. I remember a time I visited a Doctor thinking my big belly was a warning and wanting to prevent a crisis or an episode from happening, I was examined and it was deduced that I was just very constipated as I was not passing out waste properly. Eating fruits and drinking lots of water helped empty my bowels. Without emphasizing the obvious, obesity, overeating and pregnancy can also be reasons why an SCD individual has a distended abdomen. Due to the fact that an enlarged abdomen can result from a number of reasons, it is advised that a Doctor is visited to ascertain the reason peculiar to you or your loved one living with SCD and to get treatment. Feel free to contact us with your comments, contributions and questions at crimsonbowng@gmail.com. bookmark your website and keep checking for new information. Thanks for the excellent information, it actually is useful.